Normally I only read one or two books of this series neatly spread out over a year, to have something to look forward to, but also because I don't want to overload myself with Aurora Teagarden; she really is an overwhelming character. For this book (no. 7 of 8) I made an exception and started it the day after I finished The Fool and His Honey (no. 6 of 8), because that one ended so badly and sad, I just had to read on and know how Harris would manage to get the Aurora and her life going again. 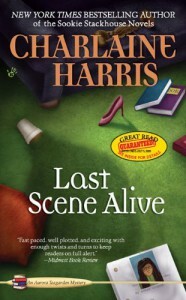 Harris didn't disappoint me, I really enjoyed this story. It's uplifting and I needed that. A character from the first book is back again and that is just how Aurora and the series got a new 'start'. Together with no.3 in the series I think I like this book best.